Replacement JBJ 28 Gallon Nano Cube Replacement Ceramic Rings. 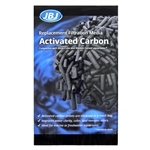 Replacement Activated Carbon for all JBJ 28 Gallon Nano Cubes and JBJ 30 & 45 Gallon Rimless Aquariums. JBJ recommends you replace your carbon monthly. Replacement Nano Cube Sponge for the JBJ Biotope Nano Cube 6 Gallon Aquarium and the JBJ 6 Gallon Nano Cube LED Aquarium. Replacement JBJ Half Moon Biotope Nano 180 8 Gallon Aquarium Filter Floss (6-Pack). Replacement JBJ Half Moon Biotope Nano 180 8 Gallon Aquarium Carbon Basket (3-Pack).